One of the most important screens in Costlocker explained in detail. The project Overview tab lists the details of a particular project, displaying its various financial data. This number represents the sum of all the items in the Cost Estimate tab, i.e. the sum of Personnel costs and Project expenses, minus any discounts, if applicable. Simply put, this metric adds up the costs of the future hours that people will track and any external costs. In other words, if everyone tracks exactly how much they estimated in the Personnel costs screen and there will be no more external costs than those listed in the Project Expenses screen, your project will cost you this amount of money. This is the profit you should make, calculated by subtracting the Estimated costs from the Revenue. These are the current project costs, calculated by adding up the costs of the hours worked so far and the expected external costs (sum of the Purchased fields in Project expenses). This number keeps growing as people track time and reflects the current state. The bottom section shows the breakdown of the actual costs – how much you’re paying for tracked time and how much you’re paying for external expenses. Actual profit is calculated by subtracting Actual costs from overall project Revenue. Again, the bottom section shows the profit breakdown, informing you how much of the profit is generated by people and how much by external expenses. If you invoice the client for the original costs of external expenses, the latter number will be 0. This is the amount of money you have left to spend. This budget will keep shrinking as people track time. It doesn’t include external expenses, as they are not exhausted by tracking time. 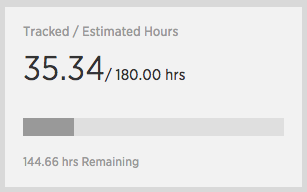 This metric shows how much time people have already tracked on your project, as well as how much there is still left. 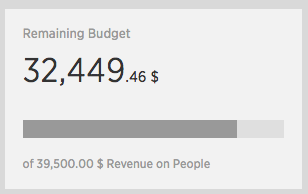 This is the percentage ratio between the Actual profit and the Revenue. In other words, this shows you how much profit you make from every hour worked in this project at this precise moment. The bottom section shows what the expected profit margin is (Estimated), i.e. what profit you should make from all the invoiced hours you estimated to be spent on this project. In this particular case, you should make almost 30 cents from every hour – the other 70 cents represent costs. This shows the discount, if you gave the client any. These are the people with rights to edit the project. This section shows the unique project ID, as well as the tags it was flagged with. Learn more about tags and the way they work. This bar shows how much time you have already spent on the project and how much time is still left. The start and end dates are defined in the first step of creating a new project.